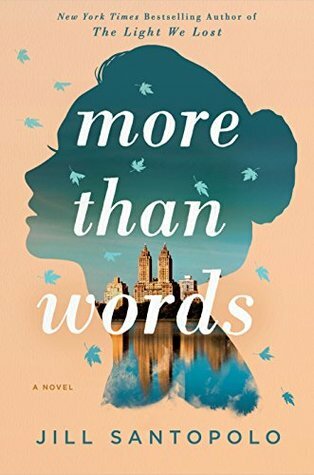 ‘More Than Words’ is a lovely story about a young woman coming into her own in New York City during a time of tremendous personal and professional upheaval. I enjoyed Nina’s story and the New York setting. Jill Santopolo is the author of one of my favorite books, ‘The Light We Lost’ so I was very eager to get my hands on her latest novel. At times both emotional and romantic, this book was a fast-paced story about Nina Gregory, who has been raised by her father among New York City’s elite. Her family owns a famous hotel and Nina has been in the spotlight since a very young age. It seems as though her entire life has been planned out for her since birth. Her father constantly reminds her of the making the right choices but Nina decides to work as a speechwriter for Rafael, a candidate for New York City mayor, before she spends the rest of her life working in the family business. Rafael is a charismatic and handsome character, unlike anyone in Nina’s life. Hers is a life of privilege, which she does not take lightly. She is dating her best friend Tim but begins to chafe at the life planned out for her. Nina’s life has not been perfect and has been marred by several tragedies. When another sudden tragedy strikes, she forces herself to confront her life and what she wants for her future. She also uncovers certain facts that cause her to question everything she has ever held dear. Will she take the comfortable path or will she take a chance and live her life to the fullest? Fans of women’s fiction will love this story. It is a quieter tale than ‘The Light We Lost’ but the author explores deeper issues such as the impact of family, friends and truth on our lives. I loved the ending to this story and can’t wait for the author’s next book! Enter to win a beautiful hardback copy with a signed bookplate! Lucy will be faced with a choice. But before she can make her decision, she must start her story–their story–at the very beginning. We’ve known each other for almost half our lives. I’ve seen you smiling, confident, blissfully happy. I’ve seen you broken, wounded, lost. But I’ve never seen you like this. Lucy meets Gabe at Columbia University on the morning of September 11, 2001. Their relationship to one another–and to the world–is forged in the crucible of that day. They both decide that they want their lives to mean something, to matter. What follows is a journey that brings the two of them together and tears them apart, dividing and reuniting them repeatedly over the next thirteen years as Gabe becomes a photojournalist in the Middle East and Lucy pursues a life and career in New York City. Theirs is a journey of dreams, of desires, of jealousy, of betrayal, of apology, of forgiveness–and above all, a journey of love. Throughout this emotional page-turner, Lucy grapples with the ideas of fate and free will: Were their lives destined to intertwine, or did they choose this path? And should they have been living a different life all along? The Light We Lost is a novel about the inner-workings of the human heart, a heartbreaking ode to the lengths we go to pursue our dreams and the sacrifices we make for love, with a surprising, emotional ending. All the stars to Jill Santopolo for this gorgeous book!! This book touched me in ways I can’t even begin to explain! The passion, the love, the choices and the heartbreak left me utterly exhausted. Lucy and Gabe came alive for me at the skilled hands of the brilliant author. Please add this magnificent and soulful book to your TBR list ASAP! The story of two people and their intertwined lives, ‘The Light We Lost’ captivated me from beginning to end. This is the kind of book you can read over and over again because the characters are simply so real. This story spans years and examines how the choices we make can change the course of our lives forever. Lucy and Gabe – first love and true love, even though time and circumstances keep them apart. Lucy and Gabe seem meant for each other, kindred spirits who seem as though they will be together forever. But Gabe is an ambitious photographer who wants to change the world. He feels compelled to follow his dreams beyond New York City, where he and Lucy share a home. And Lucy has her own life and career and refuses to give them up to chase Gabe across the world. “Was I infatuated with you? Were we infatuated with each other? Can infatuation last this long? Or has it always been love between us? I’d like to think it has. This story has many twists and turns and once I started, I could not put it down! Even after Lucy and Gabe part ways, and even though she is left utterly heartbroken, she still is there for him through the years, whenever he needs her. Lucy tries to be a friend to Gabe even though he broke her heart. It seems as though she is willing to risk everything for him – her career, her personal life and her friends – all for Gabe. But they truly have a once-in-a-lifetime love that seems to have no boundaries. I want to keep this review purposefully vague so that no spoilers are revealed. Yes this book is a heart-breaker but it is so rich and moving that I cannot recommend it highly enough. Regret, first love, choices, career, family – this book touches all the bases. Simply a breathtaking story that is one of my favorites. A must-read! Jill Santopolo is the author of The Light We Lost, the Alec Flint Mysteries, the Sparkle Spa series, and the Follow Your Heart books. She holds a BA in English Literature from Columbia University, an MFA in Writing for Children from the Vermont College of Fine Arts, and a certificate in Intellectual Property Law from NYU. Jill is also the Editorial Director of Philomel Books, an imprint of Penguin Young Readers Group, where she edits many critically-acclaimed, award-winning, and best-selling books including A Tangle of Knots by Lisa Graff, The Secret Sky by Atia Abawi, Proxy by Alex London, It’s Your World: Get Informed, Get Inspired & Get Going! by Chelsea Clinton, the Nightshade series by Andrea Cremer, A Dance Like Starlight by Kristy Dempsey and Floyd Cooper, and Peanut Butter & Cupcake! by Terry Border. When she’s not writing or editing, Jill is a thesis advisor at The New School in their MFA program in Writing for Children and Young Adults and is on the faculty of the Columbia Publishing Course. She was formerly an adjunct professor at McDaniel College, where she helped develop the curriculum for their certificate program in Writing for Children. Jill has traveled all over the U.S.—and to Canada and Europe—to speak about writing and storytelling. She lives in New York City.